Walking holidays Sardinia offers a stunningly beautiful and unspoilt part of Italy, the ideal place to enjoy a mixture of rambling, sunbathing and swimming. We have chosen paths that take you through pine forests to reach sea cliffs with spectacular views at every turn. Sardinia is stunningly beautiful and unspoilt, the ideal place to enjoy a mixture of rambling, sunbathing and swimming. The paths we have chosen wind through pine forests to reach jagged sea cliffs and rocky creeks – there are spectacular views at each turn. Myrtle, rosemary, rock rose and sea lavender border the sandy beaches, many of which can only be reached by sea or by foot. The white chalk rocks and limestone cliffs give the water an enticing crystalline pale blue colour, the playground of dolphins, whilst the coastline is dotted with stunning caves. In the islands interior, you will find a traditional land of shepherds and agriculture, rolling hills and meadows bright with wild flowers. Our itinerary starts in the high plateaux of the Supramonte massif. We take old shepherd’s trails through the region of Barbaggia to the East coast that is part of the national park of Gennargentu, arriving in the beautiful Gulf of Orosei. You will see a superb variety of terrain and have a real insight into local Sardinian life. Single supplement: £100. Reductions for triple room occupancy. £925 solo walker in single room. Departures daily (according to accommodation availability) from 1st April to 20 October. A short though strenuous warm-up as you climb the bizarre limestone landscape of the Supramonte. From the mountain’s high ridges there are airy views across the high belvederes, karst plateau and white cliffs of the Barumini Mountains. This vast area is an isolated land of shepherds, slashed with deep gorges and inaccessible peaks that are home to a rich fauna of eagles, mouflon, foxs, wild cats, and boar. It is possible to continue up to the 1348m Punta Sos Nidos. Overnight Monte Corrasi.10 kms/6.25 miles. + 500m/- 250m. 4 hours approx. Monte Maccione to Su Golgone. Today’s walk begins with a comfortable descent towards the beautiful Su Gologone spring, an opening in the limestone that is the only source of running water in the area. Walk through gorgeous Holm oak woods on the Supramonte lower slopes, with tremendous views over the Oliena and Guthiddai valleys. If you wish you can climb the steep, stony slope of the Scala di Sovana, whilst on the plateau of the Supramonte you can look for the entrance of the Grotta Orgoi. This is a strenuous climb through a rough and stony, but most of all spectacular, landscape.13 kms/9 miles. + 50/- 550. 5 or 7 hours. Overnight Dorgali. Sa Oche to Tiscali. A short transfer to the trailhead. Then walk through the homeland of the Nuraghic people, discovered only recently in a depression at the top of the mountain (local fee of 5 euro payable locally). There is an astonishing wealth of archaeological treasures in Sardinia – it is dotted with little nuraghic villages that belonged to the first settlers, and which are thought to date from between 1500 and 500 BC. The underground village of Tiscali is perhaps the most well known. Afternoon transfer from the River Flumineddu back to Dorgali for overnight.12.5 kms/8.5 miles. + 500 or 700m/- 250 or 450m. 4.5 (or 6.5 hours over Mt. Tiscali). Gola di Gorropu Gorge. Short transfer before a long but fairly easy walk through the beautiful Gola di Gorropu, one of Europe’s deepest gorges, with magnificent white walls over 350m high. The bottom of the gorge is covered in white boulders, among which are crystal-clear pools. Return along the verdant banks of the Flumineddu, followed by a short transfer to take you back to the hotel. Overnight Dorgali.19 kms/12 miles. + 200m/- 600m. 6.5 hours. Dorgali to Cala Gonone. A short drive to the ridge that links the hinterland with the coast. Then, wonderful views of the Golf of Orosei, consisting of 40 kms. of high cliffs and caves, and a handful of exquiste beaches. Today’s walk is a rather strenuous one, but very beautiful, as it takes you to the sea. Follow a mountain slope overgrown with luxuriant bushes to the top of Monte Bardia; then follow a path along the ridge, gradually descending Monte Rosso. (If you want you can make an optional climb of Monte Irveri, from where you have a beautiful view over the whole Gulf of Orosei). Finally descend to the lively harbour of Cala Gonone, where you will stay the final days in a hotel situated above the sea. 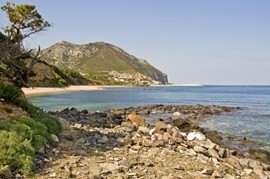 Overnight Cala Gonone.10 or 14 kms/6.5 or 9 miles. + 450 or 750m/- 850 or 1150m. 4 or 6 hours. To Cala Luna beach and back to Cala Gonone by boat. After a few hours walking along the unforgettable beautiful coast, you can relax on the white beach at Cala di Luna, reachable only on foot or by boat. At the end of the afternoon back to Cala Gonone by boat. Longer option available. You can also go diving, kayaking, fishing or just relax. Overnight Cala Gonone. 9.1 or 16 kms/. + 300 or 350m/- 300 or 650m. 4 or 6.5 hours. All rooms ensuite. Dinner included for the first five nights.